Tableau 10 has been officially available since August 2016 and there have been a number of significant improvements to version 10. Here are my thoughts on the changes to Tableau 10. Tableau 10 now allows to join the data between two different data sources. This is an incredibly powerful feature that gives analysts the power to combine datasets on the fly without the need to create a database/external data source prior. I’ve personally used this to join CRM data with Email marketing quickly and accurately that can then be used for personalisation analysis. Mobile user interface has been enhanced with DSD introduction. It is now possible to create and preview how a visualisation looks like in different mobile devices such as iPad and other mobile devices. This feature allows us to be more creative with the appearance of dashboards and is helpful to those clients who enjoy using mobile devices to view their data on the go and more versatility when presenting. This coupled with a revised and extensive colour palette allows us to create more modern looking dashboards. We are also able to highlight features within the data without losing other details, with the new spotlight tool. This lets us create bespoke dashboards the suit the audience and how they consume data, rather than relying on an ‘auto-fit’ system. We can now use filters across different data sources. A Tableau dashboard builder’s dream! In every version up until 10 there has been a long drawn-out process to be able to do cross-data filters. Although more of a background feature rather than client-facing, this allows us to build and maintain dashboards from multiple datasets (that are not able to be joined) with ease. An example may be to filter an entire dashboard that has data complexities using ‘date’. This gives our clients a lot more flexibility on Tableau Server to be able to create their own dashboards. In Tableau 9 this was severely limited, but users can now change the entire formatting and create their own calculated metrics, to name a few enhancements. We are using this feature extensively to give clients the ability to either edit our dashboards, or build entirely new dashboards based on-top of our processed data. Brand new and a great feature is the drag and drop clustering which is built into Tableau. 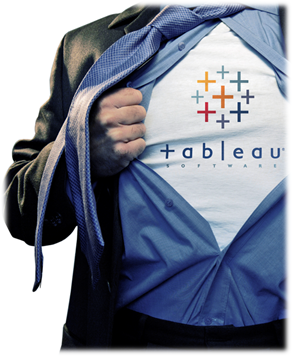 Previously Tableau only had the R extension which still relied on you having some form of R-serve. You can use the clustering with any of the visualisations available in Tableau. The K-means algorithm is applied automatically and creates a mean value so you can categorise your data or users and start segmenting groups to make marketing more effective. This can even be a great starting point to ask questions of the data and understand why certain users may react differently than others or even why certain content coverts better than others. Our team understands with any clustering it is important to understand the maths behind it in order to steer and tweak the data, we can easily do this with the describe cluster feature which allows you to do a deeper dive. Although this is a great starting feature, for more advanced clustering using other methodologies we would recommend one of the other tools we use such as R, Knime, or Python. A ‘not-so-glamorous’ addition, but still very useful! This feature gives notifications on Tableau Server for when the underlying data hasn’t completely refreshed. Previously we had written a script at the data level to understand this, but having it built into Tableau is great for the future! At Lynchpin we are vendor agnostic and don’t rely on tools to guide our analytics and we do have a host of BI tools and Tableau is just one of the weapons in our arsenal. That said we like the direction that Tableau is going in terms of innovating the product and listening to users needs to further enhance the data science capabilities. If you have any questions about data visualisations, dashboard optimisation or how to create the most effective platform to showcase analytics then please get in touch.